Blog: Two Very Happy Buyers! It always makes our day when we receive cards like this one! We always strive to exceed our client’s expectations whether they are buying, selling, or referring their friends and family to us! 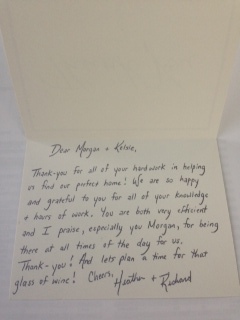 Thank you Heather and Richard for your kind words...we couldn't be happier for you! For all of your Real Estate needs contact us today!